The past couple of years I have had a lot of fun foraging for wild fruits and different kinds of wild herbs and flowers. This year there was an abundance of wild roses growing near where we live, so I decided to try to find some different recipes using rose petals. 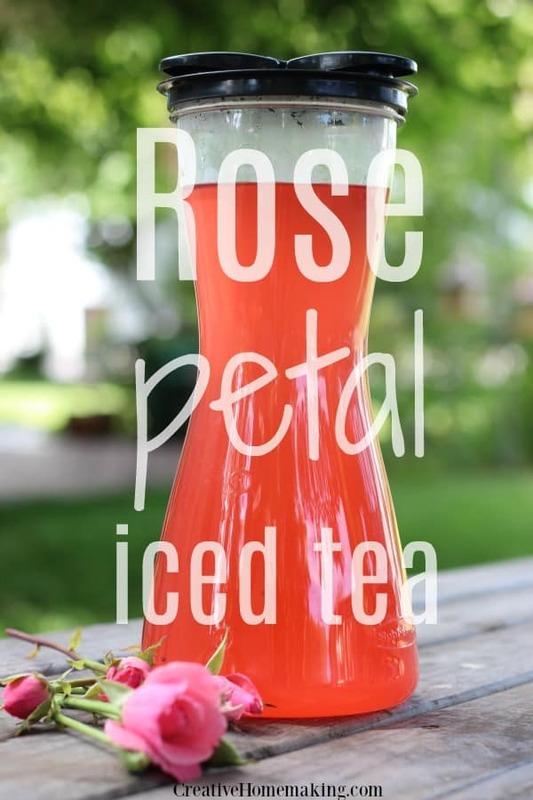 I came up with two recipes, one for rose petal jelly, and one for this wonderful rose petal iced tea. 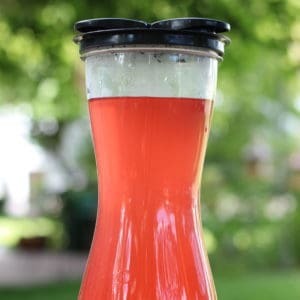 To make one gallon of rose petal tea, you will need approximately 1 cup of fresh rose petals (I’m sure you could use dried petals too, but I haven’t tried that yet). *When you are looking for rose petals to use for tea, it is important to keep in mind that you find rose petals that are free of pesticides. I picked mine up in the mountains that were away from any roadsides. Even roses growing along roadways can be coated with carbon monoxide from vehicles driving by. **I used green tea for this recipe, but you could also substitute with other kinds of tea. Place tea bags in a gallon sized container and cover with a couple inches of boiling water. Let sit for 15 minutes or so. Remove tea bags. While you are waiting for the tea to brew, place rose petals in a small sauce pan and cover with water. Bring to a boil, remove from heat and let sit for 10 minutes. Use a fine meshed strainer to strain the liquid from the rose petals. Combine the rose petal liquid with the green tea. Fill the rest of the container with water. Add sugar and lemon juice. Amounts can be changed according to taste. If you are wondering what something made with rose petals tastes like, it DOES taste like the rose petals smell. I found that the wild roses have a much stronger scent than the roses I grow in my yard (although you can use those too as long as they are not sprayed with chemicals). I was curious about if I would like the tea or not, and I LOVED it! It really is good, and a refreshing early summer treat!